1215. Approach to possible peripheral vascular injury in ABI/API is .9-.99 // Other modalities to rule out vascular injury // Management of bleeding if direct pressure fails // Goal BP in resuscitation of patient with uncorrected arterial injury // What is a PTFE shunt? Next PostNext 1216. 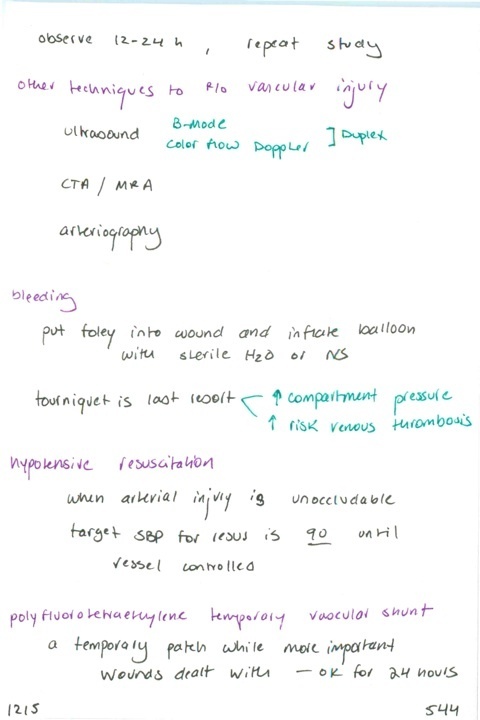 How to deal with risk of compartment syndrome after reperfusion of limb // Late reperfusion complications // Repair venous injuries? // Criterial for expectant management of minor vascular injuries – can this be done in kids?